Peachtree Publishing Company, 9781561457717, 464pp. Jennifer can't go on like this--binging, purging, starving, and all while trying to appear like she's got it all together. But when she finally confesses her secret to her parents and is hospitalized at the Samuel Tuke Center, her journey is only beginning. As Jennifer progresses through her treatment, she learns to recognize her relationship with food, and friends, and family--and how each is healthy or unhealthy. She has to learn to trust herself and her own instincts, but that's easier than it sounds. 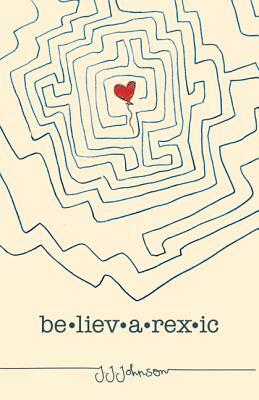 She has to believe--after many years of being a believarexic. Using her trademark dark humor and powerful emotion, J. J. Johnson tells an inspiring story based on her own experience when she was hospitalized for an eating disorder as a teenager. The innovative format using blank verse and prose, changes in tense and voice, and forms, workbooks, and journal entries mirror Jennifer's progress toward a healthy body and mind.